Style Name: 28-piece Dinnerware Set The most popular casual dinnerware collection in America, Butterfly Meadow istruly a contemporary mix and match classic. Inspired by the artistry of LouiseLe Luyer, there are many delightful pattern varriations to choose from, eachoffering an exquisite array of butterflies, blooms and other wonders ofnature, all rendered in a soft color palette. Crafted of the finest Lenoxporcelain, Butterfly Meadow is the perfect choice for today. All of thedinnerware is safe for use in the dishwasher, the microwave and guaranteessuperior freezer to oven to table performance. 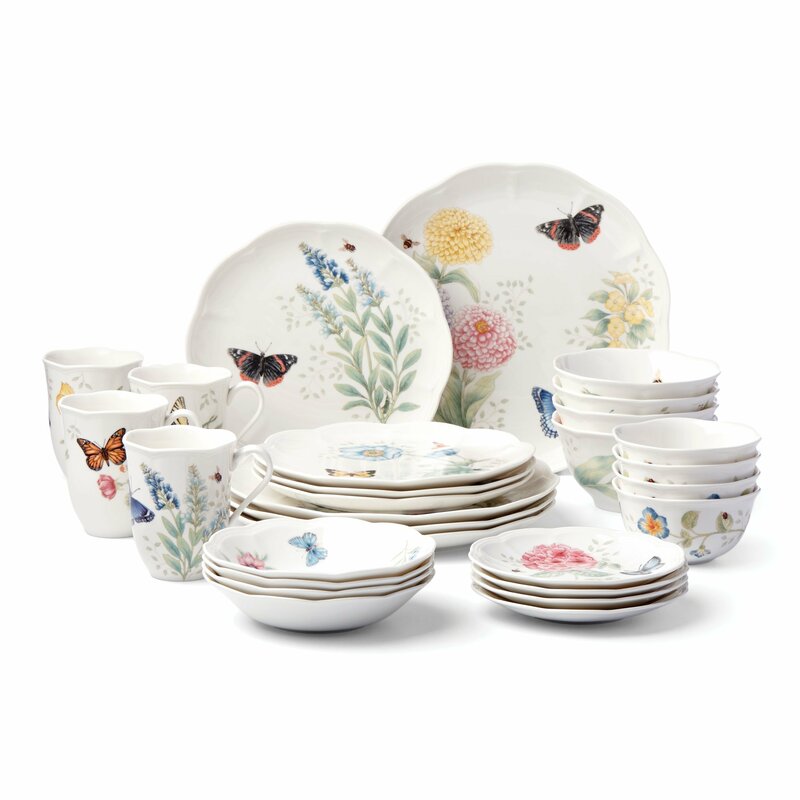 Designed for chip-resistantdurability, Butterfly Meadow will take a cherished place in your home for manyyears and offers the opportunity to expand your collection with the incrediblerange of dining, decor and gift giving choices available. Best of all, thisversatile, stylish and fun collection is created by Lenox, America's firstname in home entertaining. Known around the world for offering a uniquecombination of design, artistry and superior quality for over 125 years, Lenoxhas unmatched durability and is backed up by a lifetime replacement program toguarantee many years of enjoyment. Start building your collection and serveyour family and guests in style on every occasion from comfortably casual tofabulously formal. This 28 piece set includes four 11" dinner plates, four 9"salad plates, four 6-3/4" fruit dishes, four 6" party plates, four 12-oz mugs,four 16-oz bowls, and four 12-oz dessert bowls.